Mystery is a rare thing in music, given that we live in an age of ultra-exposure and social networking. No sooner has a demo been released, than we are regaled with tales of what the band had for breakfast, lunch and dinner, along with a detailed rundown of when each member last cried. Well, facetious nonsense aside, it is true that the gentle art of quiet dedication has been thin on the ground recently (and no – overblown, obnoxious PR exercises in “anonymity” do NOT count); after all, good music should speak it for itself, right? Well, the first Mansion EP arrived in my mailbox out of the blue one day, a simple press release and four songs. After having overcome a sense of slightly freaked-out trepidation, I decided to give it a try, and dear Lemmy almighty, this EP turned out to be the best début I’ve heard this year! Four soulful tunes of utterly entrancing Finnish hard rock, but unlike ANYTHING currently doing the rounds. This sublime quartet of tunes seem to take their cue far more from Sixties/Seventies folk-rock artists like Bread Love and Dreams or Caravan than from Deep Purple, Sabbath or Zeppelin knock-offs. “Mother’s Burden” opens with a beautiful, floating organ straight off the finer prog albums of the Seventies (and also much early Eno ambient), before Keyboardist and vocalist Alma’s sublime other-worldly voice lulls us into the land of subtle rhythm guitar and Jinx Dawson-esque chanting. There’s a heart-stoppingly beautiful quality to the singing, coupled with a restrained, crisp sound to the instruments of Jaakob, Immanuel, Veikko and Mikael – remember when every band wasn’t desperate to sound muddier than the last? Interestingly, the press release claims that the band revolves (thematically) around an End Time cult called “Kartanoism”, which flourished in Finland between the Twenties and Fifties. Surprisingly, the internet informs me that this is not a load of cobblers, but based on fact!! If we can have a myriad of “occult rock” bands, why not have “cult rock”? If Manson was able to pull off a half-arsed career with limited talent, this Finnish horde will take over the world with their level of skill! I dread to think of the dross that will follow this brilliant band if this also becomes a fad, but I digress… The opener is a beautiful ode to suffering motherhood and salvation, a gospel from an enchanted room, but tinged with the morbidity of Coven. 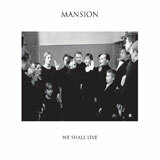 The EP continues in the same superlative vein, with “We Shall Live” winning best lyric of the year: “Keep the wretched priest in the dark”, a brilliant up-tempo number that lacks none of the soul or steady, prog-rooted riffing of the opener, almost a dancefloor-filler! In fact, “Sorrowless” is even more funky (“To hell and to the Devil you will go! !”), before we are plunged back into morbid darkness for the closing majesty of the huge “Slumber Sermon”, Alma’s voice sounding like Steve Sylvester if he’d escaped the asylum, ending in a chilling rasp of “AWAKE!”. These four songs are devoid of solos, ego or pretension – they are a quartet of amazingly focused, tight-knit works of well-honed art, played by five musicians who understand the power and divinity of music. Every now and then, a new band comes out of the blue and leaves my jaw on the floor, and Mansion have done just that. Bands like this are the reason we at the Shaman exist at all, and I sincerely hope this band become huge, because based on the promise this first release shows, they damn well deserve it!